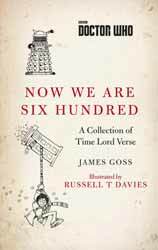 Now We Are Six Hundred: A Collection of Time Lord Verse (2017. 118 pages) is a collection of whimsical poems written by James Goss and illustrated by Russell T. Davies in his first official job as an illustrator. It’s a riff off the 1927 Now We are Six, a collection of poems by A. A. Milne, creator of Winnie the Pooh. Goss has both adapted Doctor Who stories into novels as well as providing several original tales. If you don’t know who Davies is I’m guessing you came to this site by mistake. The poems are bookended by poems which sees the good Doctor really turning up in the hundred-acre wood. In-between there are numerous poems which cover all the doctors as well as the more memorable companions and villains. The real draw here is Davies' penmanship, which demonstrates a whimsical bent to his art and there is barely a page without some form of doodle. The poetry is really going to be a matter of taste. This is in some ways an odd retrograde book given the new change of direction which the show is looking for. Although framed as a children’s book it is likely to be impenetrable for all but the most avid fan of the show. I say this as some of the poems require an encyclopedic knowledge of the show and its history with many reference to things which happened many years ago. So, is the target audience adults? If this were the case, then why not commission a collection from established poets? I’m guessing that the great and good thought that the book may be some form of introduction into poetry, which is a laudable venture but why base it on a book that’s nearly a hundred years old? True, many young minds will not spot where Gross has based his poems on the original Milne and maybe that’s not the point. So, as a book of poetry its flawed, but as an introduction to the art form of poetry it might just snag a few young minds.